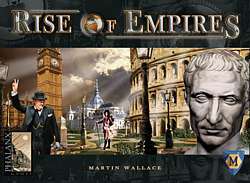 In Rise of Empires two to five players are building their own civilization from the dawn of history to present times. All players start “small” and fairly powerless, however, through clever play they try to gain wealth and progress in several areas. Rise of Empires is divided into three eras. Each era consists of two game turns. The core of the game is the Action Display where players conduct various actions during a turn. The first turn in an era is called the “A” turn, the second one the “B” turn. In a way, the “B” turn is a mirror image of the “A” turn. This guarantees a lot of decision-making and nail-biting suspense. Victory points are scored for building cities, having an empire, for progressing in science, and for trading goods. In contrast to some other civilization type games, Rise of Empires plays fairly quickly. A full game can be completed in less than three hours. Rise of Empires breathes new life into the civilization type games genre!